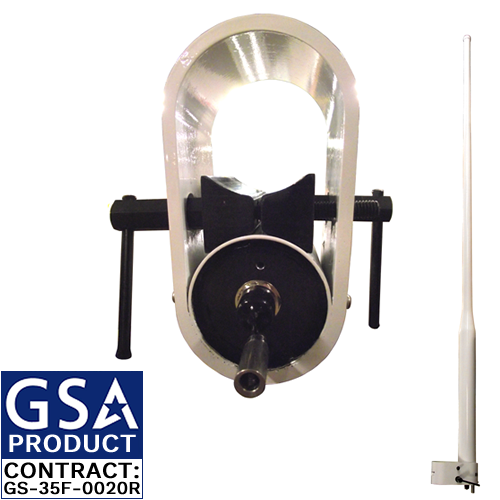 This white single output VHF/UHF dual frequency air traffic control military MULDIPOL™ antenna with a diplexer is ideal for ground-air-ground, air traffic control and base communications applications. It provides wide band VHF/UHF frequencies into a single output with a diplexer for users in maritime, land mobile and tactical line-of-sight communications, operating at 108 to 174 and 225-400 MHz. The D2211 is also effective for civilian and military air traffic control operations. D2211-L - Lightning Rod model. D2211-N - Olive Drab model.